Lemon, the ordinary citrus fruit that we eat can be used to make you beautiful. Lemon is rich in vitamin C and can boost our immune system but it is also healthy for our skin. The health benefits of lemon oil can be attributed to its stimulating, calming, carminative, anti-infection, astringent, detoxifying, anti-septic, disinfecting, sleep inducing, and anti-fungal properties, which is of particular benefit to people with problematic skin. Lemon extract contains enzymes which help remove dead skin cells, it safely eliminates pimples and prevents oily skin giving you smooth, blemish and oil-free skin. Lemon soap may help ease your mind on a stressful day, helping you find peace and a good night's sleep. 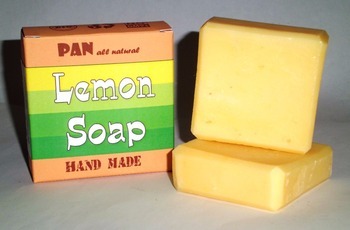 For best results, use lemon soap for facial wash, once in the morning and once in the evening.